The journey to become an MCSA certified is quite complicated because an individual has to pass three different exams to achieve this certification. The importance of becoming an MCSA certified is completely undeniable because there are multiple job opportunities available for MCSA certified professionals. So, without any second thought, you should immediately jump into this field because there are tons of options available. Microsoft 70-410, 70-411, and 70-412 are the three exams that individuals must take if they want to achieve MCSA: Windows Server 2012certification. 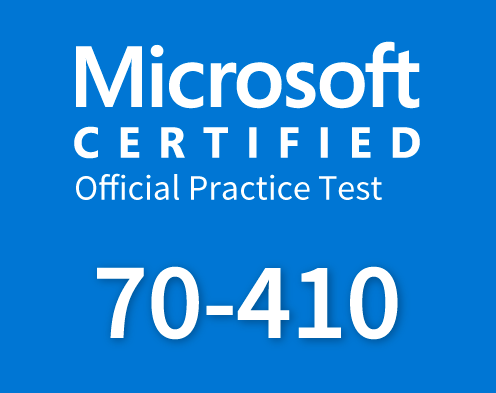 Microsoft 70-410 is the first exam that will help you start your journey towards becoming an MCSA certified professional and today we are going to put some light on this test. We will discuss other exams in our upcoming articles. So, if you need to know the details about all the three tests, you should stick to our newsletter because we are going to describe all the three exams gradually. Here is the important information about Microsoft 70-410 exam. 3 Why is Microsoft 70-410 certification so popular? 4 How to pass Microsoft 70-410 exam? Microsoft 70-410 is the first step that will help you start your journey towards becoming an MCSA: Windows Server 2012certified professional. This exam will determine your ability to install and configure the fundamentals within Windows Server 2012 including features like Group Policy, Active Directory, Core Network Services, and Hyper-V. This exam also provides the proof that you have the essential skills that are important for configuring Windows Server 2012. If you are dedicated to becoming an MCSA certified professional, you should prepare well for this exam because it is not an easy one to pass. The complexity of this exam is almost equal toICND2 exam. So, you should come prepared on the day of the test because it will carry many unpredictable things in it. The exam is connected to a technology that is popular all over the world. There are many top companies that are using the Windows Server 2012 and they need to hire the professionals that can easily install and configure different functions for them. So, you can take advantage of this opportunity by passing Microsoft 70-410 certification exam. There are tons of advanced functions introduced with the Windows Server 2012 and only the certified professionals can carefully implement all of them. So, you can achieve a better job position after passing this exam. Why is Microsoft 70-410 certification so popular? Microsoft is definitely a well-known name in the IT industry and we cannot deny it. A lot of companies are using the products of Microsoft. Windows Server 2012 is one of the most popular products of Microsoft that are being used all over the world. The popularity of this product means that there is a huge need for professionals that can carefully handle the server. The most interesting part is that there are many individuals that are trying to achieve this certification because they want to grow their skills and the income as well. But you should not be worried about the competition because there are lots of opportunities available and you’d never face any problem while trying to find a job. How to pass Microsoft 70-410 exam? We have already mentioned that Microsoft 70-410 is a very complicated exam and you may find yourself in a lot of trouble if you did not prepare for this test. The Microsoft Virtual Academy is the best option you can use to prepare for Microsoft 70-410 exam. https://www.prepaway.net/microsoft-70-410-dumps.html PrepAway, CBTNuggets are another popular platforms where you can find the perfect tutorials for this exam. You should carefully listen to the tutorials and then try to practice your knowledge on daily basis. Microsoft has published a book “Installing and Configuring Windows Server 2012 R2” that candidates can use to prepare for the exam. The book is very important and you should not skip it at all. And most important of all, take practice tests. They are going to make things a lot easier for you. Practicing your skills with the accurate practice tests means that your chances of passing the test are increasing day by day. For example, if you took the exam without giving a try to the practice tests, your chances of passing would be close to zero. But if you take the practice tests, your chances of passing the exam will increase surprisingly. There are different platforms where you can to easily find the training courses for Microsoft 70-410 exam but Microsoft Virtual Academy and Udemy are the mail platforms that we recommend for the training. Microsoft 70-410 exam dumps are worth every penny and you should not ignore them. They include questions that you can meet at the exam, that’s why, the step you should take before getting exam dumps- is the proper preparation. For that, read study guides, watch video lecture, take online training course. Only after having studied the topics of the exam thoroughly, use exam dumps for revision. Nowadays, there are a number of websites offering braindumps for exam preparation. Find the most reliable ones, as for my experience, it says that ExamCollection, Exam-Labs, PrepAwayare the perfect platforms where you can find the best exam dumps. The dumps you find here are free, and can be opened with VCE Player which works with .vce format. The advantage of this tool that appeals me most, is training in the real exam environment. First of all, you save your time at the exam, secondly, you can practice tests unlimited times and see which topics should be re-read and re-studied. Suppose, the information you get, makesyour preparation process easier. The importance of Microsoft 70-410 exam is now visible to you and you can now decide whether you should take this test or not. We recommend you to give it a try because it can open multiple ways towards success.